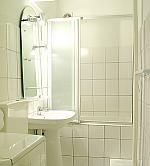 EastComfort offers discount accommodation in Bucharest apartments. So if you need to book a holiday apartment or short-term accommodation for a business project in Bucharest you have come to the right place. For a cheap accommodation in Bucharest we recommand this nice apartment. This flat has been furnished with style and decorated with a subtle, modernist eye for the perfect Bucharest accommodation. Bright, wide spaces, having parqueted floors, leather sofa and armchairs, fully furnished and equipped, this apartment offers home atmosphere. The coquettish kitchen is fully equipped, with up to date devices and the bathroom has full-length bath and shower fixture.